Who doesn't love stained glass? 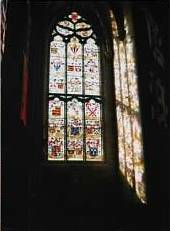 I love stained glass, especially when the sun is shining through and casts colors throughout the room. Traditionally, glass is melted and has color added to it while it is still in liquid form (the color is usually from metallic powders or small pieces of metal). Small pieces of glass are placed in a pattern and "glued" together with pieces of lead and supported by a strong, unbending frame. However, I'm not going to let my children play near a super hot fire, melt glass, and solder lead. I know...I don't let them have any fun, right? I have two much simpler options for making your own stained glass! 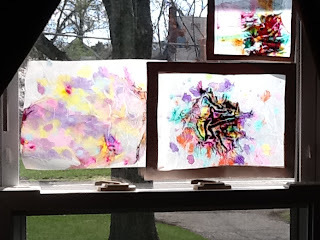 Option 1: For an easy "stained glass" craft, you will need contact paper (2 pieces per stained glass), scissors, and pieces of colorful tissue paper. Before removing the contact paper backing, cut out a shape (oval, heart, square). You will need two shapes (for the front and back). Remove the backing from one piece of contact paper. Lay down thin pieces of tissue paper, but leave edges open. Remove backing from second piece of contact paper and lay on top, sealing the tissue paper in. Option 2: If you have a ton of old broken crayons like I do, this is a great option. You will need newspaper, wax paper, crayons, a pencil sharpener or cheese grater, and an iron. 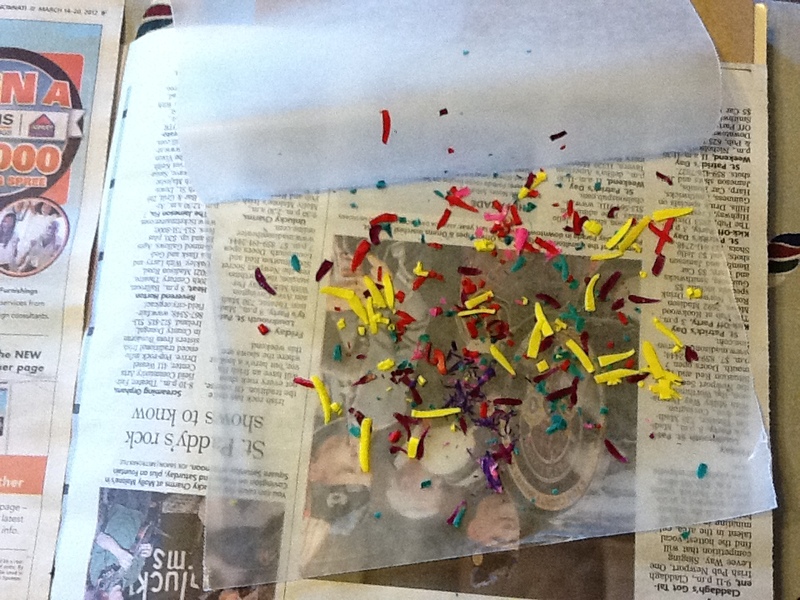 Place down a piece of newspaper and then lay down a piece of wax paper. 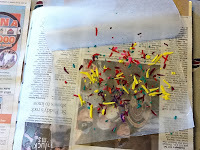 Shave or grate pieces of crayon onto the wax paper. 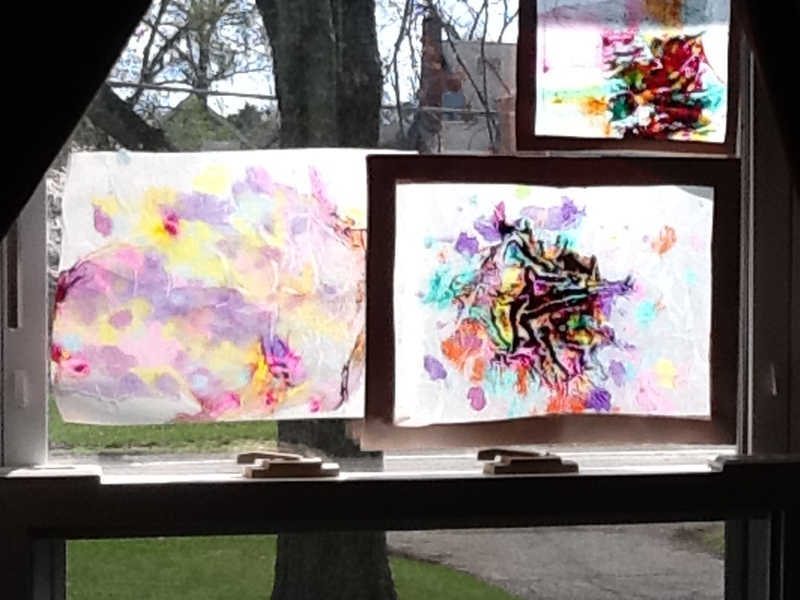 (Note: the smaller amount of crayon shavings, the more see through the stained glass will be. Also, spread out colors. Otherwise, it will turn to brown or black once the crayon melts all together). With an iron (dry heat, no steam), quickly iron the newspaper. (Don't keep on too long, just a second or two). Allow to cool. You can make a frame out of construction paper and hang from a string, or tape to a window to hang as it.